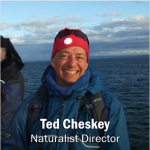 This blog post was written by Ted Cheskey, Naturalist Director at Nature Canada. This past weekend, my wife and I travelled across central Ontario from Ottawa to Tobermory to spend the Victoria day weekend with family and good friends. We left our home around 2 pm. Nearly four hours later while Cris was driving between the little towns of Kinmount and Norland Ontario, on Regional Road 45, I spotted a turtle in the middle of the road. There was lots of traffic, folks headed up cottages for the long weekend. 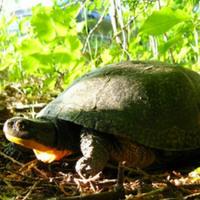 The turtle was large, dark, with a high shell – meaning Blanding’s Turtle, at Threatened species in Canada and Ontario. 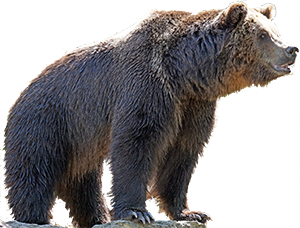 It wasn’t moving and looked to be injured, and extremely vulnerable to getting completely crushed. I asked Cris to pull off the road, which she did into a small laneway into the forest. The road was busy so this was tricky. We drove back to just past the turtle and safely pulled off the road. Cars were narrowly missing it as it was literally in the very middle of the road. When I saw a large gap in traffic, I sprinted down the road, grabbed the turtle and took it to the shoulder, thinking that I would release it in a safer place. 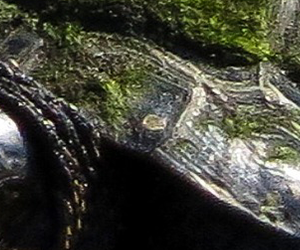 Blanding’s Turtle, photo by Beatrice Laporte. However, I saw that the posterior part of the carapace (upper shell) was partially crushed, and there was a fair bit of blood, but the turtle was clearly alive though withdrawn into its shell. I figured that it would die for certain from loss of blood, infection or injuries I could not see if I just released it, so I ran back to the car, and we made space in the back of the hatch, on a rubber mat, where we set it. Cris used her smart phone to try and find out what to do. Eventually we talked with Graham, my son-in-law, who was in Tobermory awaiting us to solicit their help in figuring out what to do. We learned that there is a turtle hotline in Ontario – but by then it was around 7 pm on Friday, and all we could do was leave a message. We stopped in Orillia, purchased a small blue rectangular recycling bin, and put the turtle in it. It was still bleeding. We also purchased ice and put some in a plastic bag to cool down the turtle and hopefully slow the bleeding. We drove to Tobermory and occasionally heard the turtle moving. The turtle spent the night in the back of the car in the bin, but in the morning I opened the hatch to discover it had climbed out! Though it was still bleeding, that was a great sign that all of its legs were working well. In the meantime, the Ontario Turtle Conservation Centre called back and arranged for us to drop the Turtle at a Veterinary hospital in Collingwood – about 2.5 hours away. Ironically we had driven past this place the day before about 8 pm. We then drove back to Collingwood, dropped the turtle off at the hospital to the dedicated staff where they stabilized it.